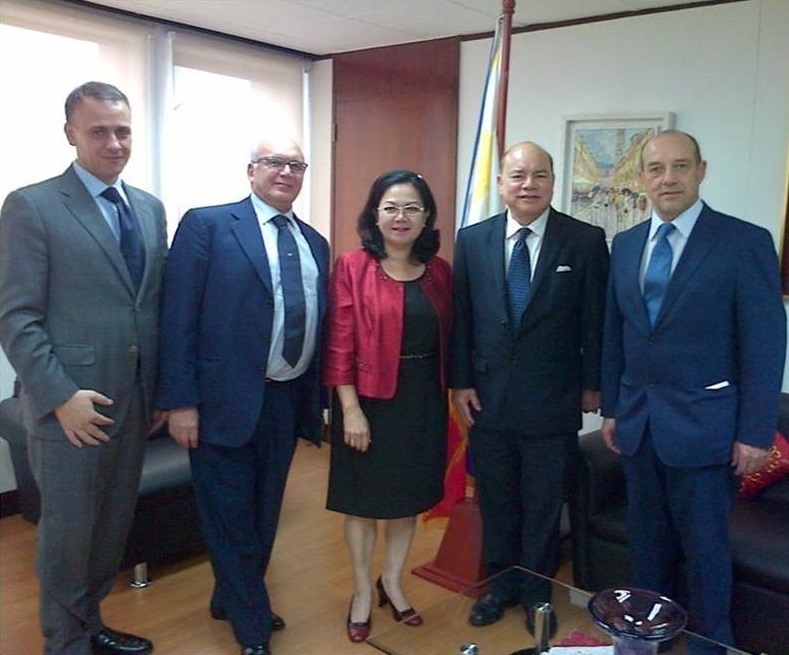 (From left) Mr. Mauro Iannucci, Mr. Giorgio Fanara, Assistant Secretary Maria Zeneida Angara Collinson, Ambassador Virgilio Reyes, Jr., Philippine Honorary Consul General Fabio Fanfani in Florence. 21 February 2014 - Florence-based Philippine Honorary Consul General Fabio Fanfani called on the Department of Foreign Affairs (DFA) Assistant Secretary for European Affairs Maria Zeneida Angara Collinson last February 19, to apprise the DFA of his work in relation to relief efforts for the victims of natural disasters in the Philippines. Mr. Fanfani, who was accompanied by Philippine Ambassador to Italy Virgilio Reyes, Jr., provided Assistant Secretary Collinson with a copy of the 14 February 2014 letter of the Region of Tuscany’s Minister of Health Luigi Marroni to Health Secretary Enrique Ona relative to the total contribution of Tuscany of about €53,000 to various health projects in the Philippines over the years. Mr. Fanfani will visit Cebu to handover his donation to the University of the Philippines (UP) Tacloban library. He is also evaluating how the region of Tuscany could provide further assistance to those affected by Typhoon Yolanda.